OCZ debuts the Agility 4, a new budget SSD with the Indilinx Everest 2 controller. It's available in 64GB, 128GB, 256GB and 512GB capacities, with the latter one delivering a read speed of up to 400MB/s, write speed of up to 400MB/s, and 85,000 IOPS random 4k write IOPS. Full specifications can be found over here. OCZ Technology Group, Inc. (Nasdaq:OCZ), a leading provider of high-performance solid-state drives (SSDs) for computing devices and systems, today unveiled its new Agility 4 SSD series that delivers an ideal balance of 6Gbps SATA III interface speed, exceptional input/output operations per second (IOPS) performance, and enterprise-grade endurance and reliability all in a value-oriented SSD. Utilizing OCZ’s cutting-edge Indilinx Everest 2 controller platform (first introduced in the flagship Vertex 4 SSD series), Agility 4 SSDs offer a cost-effective alternative to other SATA III SSD solutions in the market making them ideal for mainstream entertainment, gaming, and mobile storage applications. Powered by its Everest 2 controller platform, the Agility 4 excels in real-world compressible and incompressible workload performance. The series consistently delivers transfer rates of up to 400MB/s, and up to 85,000 random write IOPS. In comparison to first generation Everest controller platform, the transactional performance of Everest 2 doubled under typical use case scenarios. Leveraging an industry-leading feature-set, the Agility 4 SSD series offers superior endurance and reliability without the need for internal data compression (that typically leads to decreased performance of ubiquitous files types). The dual core controller architecture also includes an advanced error correction code (ECC) engine, dynamic wear-leveling, auto encryption, and Indilinx Ndurance™ 2.0 technology that addresses and overcomes specific shortcomings of NAND flash memory to extend flash life well beyond the manufacturer’s rated program and erase cycle specifications. With the incredible responsiveness and reliability benefits that OCZ SSDs offer over traditional hard disk drives (HDDs), the Agility 4 is ideal for mobile and desktop users seeking exceptional speed and endurance at an exceptional cost per gigabyte. 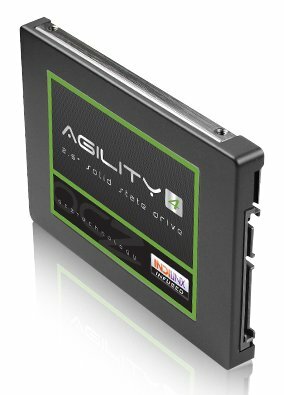 Available in a boot-drive sized 64GB model, up to 512GB capacity for mass storage, Agility 4 SSD solutions are backed by a 3-year warranty and will be available through OCZ’s global channel.